Monument Park has always been a hallowed place in Yankee Stadium. The greats that have worn Pinstripes are honored there, so are the numbers that have been retired. As of this date, 17 numbers will never be worn by another Yankee player. By the end of this season it will be 20. On different dates throughout the season Bernie Williams, Jorge Posada and Andy Pettitte will be honored with a day dedicated to them during which their numbers will be retired. To honor them now, we will look at some of their on-card autographs in this installment of Hump Day Hits. All of these cards are from my personal collection. Those of you that have been following All About Cards know I go for on-card autographs. All three of these players are have a limited selection. Let’s start with the one with the least amount available. Getting one of Bernie Williams on-card autos at a reasonable price is no easy task. 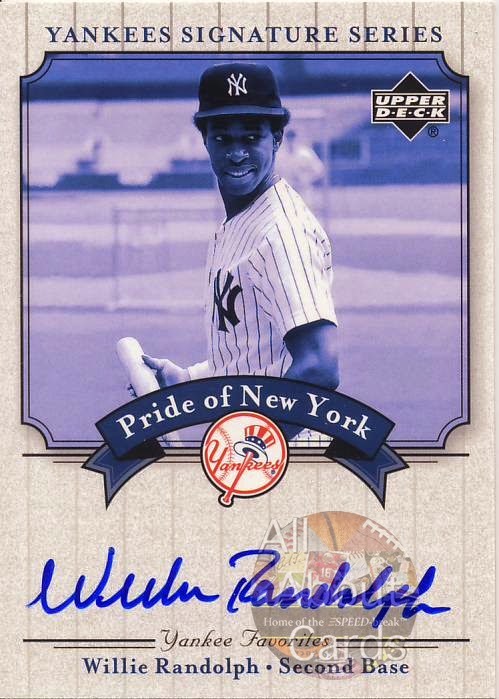 Up until 2013 Williams had signed for just 4 card sets in limited numbers for Upper Deck, Donruss and Fleer and a small number of Buyback autos for Donruss’ Recollection. 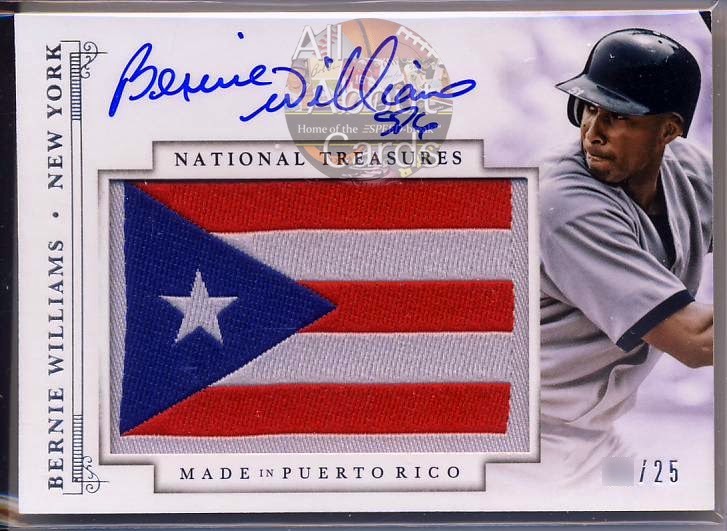 In 2013 Panini America brought back Bernie Williams for on-card autos but in a very limited quantity, just 3 set releases and a TOTAL of 90 cards. That’s not 90 different types of cards, he has literally signed his name on-card 90 times, 44 times for 2013 Panini Pastime, 31 times for 2014 Immaculate and 25 times for 2014 Panini National Treasures. I own one of those cards. Williams will be honored by the Yankees on May 24. Jorge has a limited number of on-card autographs too, but not as severe as Bernie Williams. He signed a good amount for Upper Deck, Donruss and Topps between 2011 to 2007 He started signing again in 2013 for Panini and then came back to Topps in 2014 and that’s when I went for his autograph card. 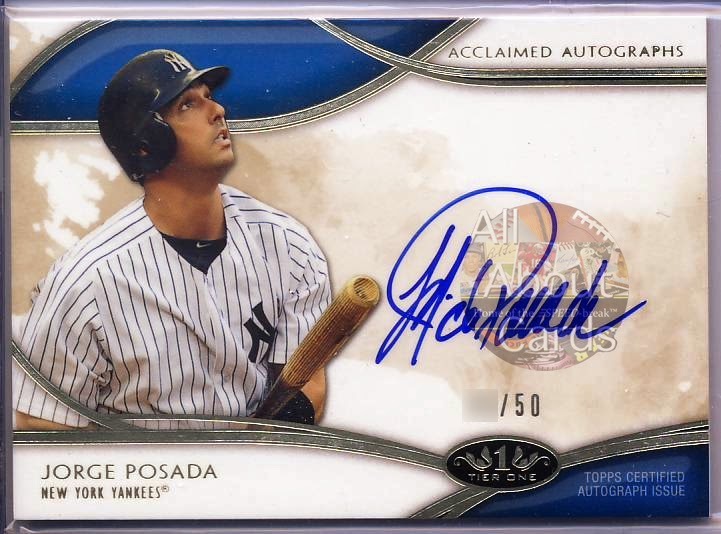 Andy Pettitte has spent less time than Jorge Posada signing, but has about the same amount of cards as Posada. From 1996 to 1998 he signed for Leaf, Donruss, and Topps, then he stopped. He returned in 2012 and signed exclusively for Topps but stopped again in 2013. During that time period I picked up his autograph. Pettitte will be honored by the Yankees on Aug. 23. On a side note, Willie Randolph will be honored by the Yankees too, this year during Old-Timers' Day on June 20, but there are no plans to retire his number 30. His on-card autograph is about as scare as Bernie Williams, having signed only for 2000 Greats of the Game, 2001 Upper Deck Legends of NY, 8 copies of a buyback for 2004 National Pastime, 2004 UD Yankees Classic Scripts, another 29 copies of a buyback for 2012 Leaf Memories 90 and this one that I own 2 copies of that was an SP limited to 283 copies. 2003 Upper Deck Yankees Signature, Pride of New York Autographs. Here are the 17 numbers belonging to 18 Yankee players have been retired so far that Williams, Posada and Pettitte will join.